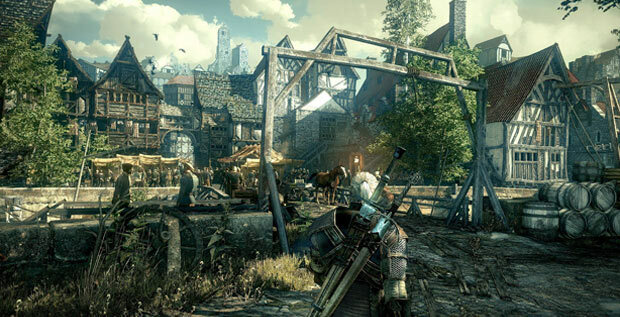 Here are some beginner and advanced The Witcher 3 hints, tips and tricks. Alcohest can replenish potions when meditating, so always try to keep some on you. Alcohest can be bought from stores and found in the world. Faster health recovery / healing - In order to heal faster, try drinking something like water, and then following it up with some food. Food has an increases vitality regen if used after drinking. Finding food - On the harder difficulties, food will be needed often. The best way to get a lot of food is to visit a bar. The bar in Oxenfurd Harbor - Velen No Mans Land always has a lot of food for sale. You can also find food in random containers located out in the wild and inside houses. If you're too far out in the wild, and don't want to visit a bar, you can always hunt animals for food. Respecing - You can respec your skill points by visiting Kierra. She sells a potion of clearance which will reset all of your skills. Fighting underwater - You can use your crossbow underwater, it does a lot of damage! Parrying - If you hit block at the right time during combat, you can parry the enemies attack. Enemy Weakness - Don't forget to check your beastiary (under Glossary) if you're having a tough time with an enemy. The beastiary can show you what the enemy is most vulnerable against. Quests failed because of the main quest - If you fail a certain quest that you wanted to do during the main quest, try loading a previous save and finish those side quests before doing the next storyline quest. Upgrading items - Some items like the Feline steel sword can be upgraded at the armorsmith with a diagram, so try to keep them if you have the space. Breaking obstacles and objects - Some objects, doors, etc can be broken with your sword or the Aard Sign. Objects that can be destroyed are marked with a white triangle icon. Buffing before fights - Don't forget to buff before fights. Adding specific oil to weapons depending on the enemy can greatly help you. Be careful using Igni near green smoke because it will blow up. You can use this against enemies too, wait for them to be in the green smoke, move back, and use igni. Opening locked doors - The AARD sign can be used to break open some locked doors. Illusions - If you see a glowing area, walk toward it and press X to open a door to another area. Difficulty scaling - A recent patch added difficulty scaling to the game. This makes it so no matter where you go enemies will either be scaled at your level or they will be higher level than you. This keeps the game challenging and helps prevent overleveling when exploring and doing side quests. PC Vsync Issues - The PC version of The Witcher 3 has VSYNC issues on some PC configurations, but there is a fix. Simply set vsync to off and run the game in Borderless Windowed mode instead of Full Screen. This will both get rid of screen tearing and remove choppy gameplay that happens in Full Screen / Vsync mode.